Occupational Health Nursing (OHN) is a distinct specialty within the field of nursing. Occupational Health Nurses practice in a wide diversity of settings within both the public and private sectors. They are as to treat, diagnose and administer care to workers in a place of business. 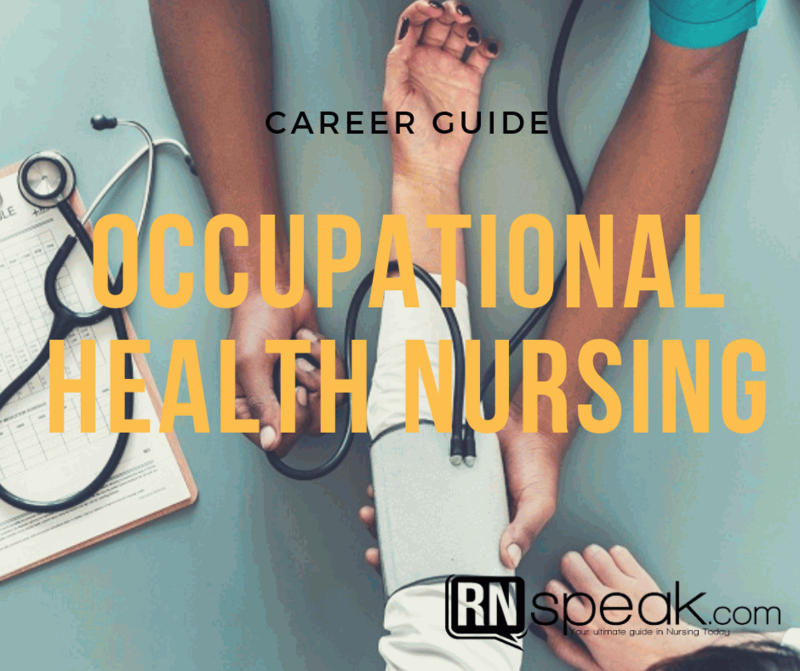 This article would give you a detailed Career Guide for Occupational Health Nursing, as well as promising job opportunities both here and abroad. In all types of workplaces, from groceries to offices to call centers to factories, health hazards are present. Health hazards include exposure to chemicals, obstructions, machinery, radiation or even employees’ carelessness. Occupational Health (OH) refers to care for and protecting the workforce you serve. OH involves identifying and controlling workplace hazards. The practitioners in this field ensure the safety of the employees and workplace. Occupational health nursing is a field in nursing that specializes in providing and delivering health and safety services to employees. It involves identifying and controlling hazards in workplaces providing the employees a safe working environment. It focuses on preventing injuries and illnesses at the same time promoting health and making sure those ill or hurt employees are getting the care they need to recover and get back to work. An occupational health nurse must be good in communicating with the employees, employers, medical professionals and insurance companies. One should be good in educating individuals on safety. They must also have queer eye for details and efficient in problem solving. OHN autonomous, meaning occupational health nurses are able to make judgment calls and design a course of action to provide health services to the employees. In emergency cases in the workplace such as injuries and illnesses, the occupational health nurses provide the best quality care for the worker. They work on the prevention injury and early identification of health hazards, which decreases the chance of health related compensation for the workers. Health education and referring workers to outside healthcare institutions is also their job. Direct patient care. One should be knowledgeable in treating individuals that get hurt and ill due to workplace hazards. This included tending to injuries, administering medications and performing rehabilitation therapy to injuries. Health promotion. The primary goals of nurses is to provided and assist patients to getting better. Occupational health nurses are expected to promote health to their employees by preventing injuries and early identification of health hazards in the workplace. Analyzing the rate of injury and provides strategies for prevention. The occupational health nurse is responsible in collating information and responsible in documenting work-related injuries or illness. They analyze it and report it to the employers or to the concern group of people. They may suggest changes in procedures to promote a safer environment. Ensuring the optimal health of employee populations. Occupational nurses ensure that employees are capable and are in their perfect health to perform their assigned duties. This may include annual physical checkup, random drug testing and alcohol screening. Health education and training programs. Occupational health nurses designs program for the employees to improve their health and support a positive lifestyle like coping with stress. They also provide education for the employees and employers on preventing injuries in the workplace. Provide counseling and crisis intervention. The occupational nurse provides counseling for employees that would develop behavioral or psychosocial distress in their workplace. Occupational nurse also assume the responsibility of referring employees to other community resources or healthcare institutions. Management of occupational and environmental health services. Occupational health follows a structured list of guidelines in providing safety and health standards and it is the responsibility of the occupational nurse to make sure that it is followed by the institution. The occupational health nurse has a wide range of responsibilities that stretch from being a clinician to educator, counselor, evaluator and consultant. Occupational health nurses should possess knowledge in different area which includes nursing, medicine, occupational health, public health, psychology, personnel management and healthcare administration. This specialized field of nursing allows a nurse to serve as advocate to employees in ensuring adequate healthcare is provided for them. Occupational health nurses provide their services in different settings such as schools, hospitals, shopping center, and offices, hospitals included. In the Philippines, Occupational Health Nursing jobs exist in manufacturing and production industries. Consulting or financial also hires occupational health nurses for consulting projects that involve work-related safety or health. An occupational health nurse job has a wide range of variation. They’re found in an astonishing range of industries, including agriculture, construction, aerospace, mining, and more. Occupational nurses are needed by business and other employers because safety and illness of their employees would affect their frontline, as much as, repetitive accidents in the workplace would distraught the company’s and/or business reputations, so businessmen want to avoid safety and health issue to avoid unnecessary compensation. There is globalization increase in awareness of occupational health and safety. Moreover, occupational health clinics are gaining traction in the United States to meet the needs of minor healthcare issues in the workplace. More and more businesses are hiring occupational nurses after realizing that the health and safety of employees has an impact on their profits and revenues. Occupational health nurse is typically different from the traditional nursing jobs in the hospital. It requires additional education and experience. Occupational health nurses that hold a post-graduate degree and certification such as Certified Occupational Health Nurse Specialist credential, has a higher chance of getting hired easily with a higher salary. According to Payscale.com an occupational nurse in the Philippines earns an average salary of 169,021 pesos ($3,147) per year. According to Salary.com, in the United Stated the average salary for Occupational Nurses is $86,538 (4.6Million pesos) per year. Must be a Bachelor of Science in Nursing. Must have attended at least three (3) Conventions with OHNAP within five (5) years of Active Membership. Must have earned a minimum of sixty (60) contact hours of Scientific Meetings within five (5) years; 80% of which must be taken from OHNAP. Must be Active & with continuous membership to OHNAP for five consecutive years upon application. Must present an updated PRC license/ card. Must be currently employed as Occupational Health, Safety & Environmental practitioner. Must have at least five (5) years of experience as Occupational Health Nurse. Must have attended an Advance Course in Occupational health & Safety for Nurses offered by Occupational Health Nurses Association of the Philippines (OHNAP), Inc. Knowledge on critical care, ambulatory care, community health and emergency nursing would be essential in the practice of an Occupational Health Nurse. Productivity and competitiveness of each OH Nurse, they should update themselves with the latest trends in their field. This is to ensure their adherence to quality standards. To strengthen the skills and update regarding the new trends on OSH, trainings are provided. Health Care Advantage Training Institute Inc.
LUCE Global Environmental Health and Safety Specialist, Inc.
MSRS Safety, Health & Environment Training Services Inc.
Produkto Serbisyo Para sa Safety Professional (PSSP) Inc. Note: The author and the site are not connected with any of these companies. The demand for trained, experienced and certified Occupational Health Nurses is on the rise because employers try to search for ways to cut costs and to keep up with employment laws. If you would like to work in a specialty area that is rewarding financially, you might want to consider the advantages of becoming a Certified Occupational Health Nurse. Involve yourself with post-graduate studies and continuing education to earn your certificate. The training companies mentioned above provide Basic Occupational Safety and Health Training (BOSH), Construction Occupational Safety and Health (COSH) and other trainings that are essential in fulfilling the duties of an OH Nurse. Trainings such as Industrial Ventilation Training, 40-hour Industrial Hygiene Training, Drug Assessment Team Training, Training on Ergonomics in the Workplace and Training on Managing Emerging Health Issues in the Workplace, are scheduled by different companies in different locations of the country. BOSH and COSH training are conducted regularly as compliance to the Philippine Law. Department Order No. 16 of 2001, Training and Accreditation of Personnel on Occupational Safety and Health, mandates that there should be a trained and accredited OSH personnel in their company to ensure that safety and health of their employees. OHNAP provides different trainings and updates for OH Nurses. One is the Basic Occupational Safety and Health Training (BOSH) explains the OSH concepts and principles that are essential in the practice of OHN. It assists applicants in identifying the important elements in the OSH situations. They determine existing and potential safety and health hazards. They introduce basic knowledge on pertinent provisions of Philippine laws that refer to occupational safety and health. Attendees of this training should be able to determine potential safety and health hazards based on the major fields. Both trainings are open to all not only nurses, but these trainings are the foundation of OHN. Most common industry for OHN is in construction and manufacturing where a large number of employees are catered. There are other training companies accredited by OHNAP and DOLE. The demand for trained, experienced and certified OHN is on the rise because employers try to search for ways to cut costs and to keep up with employment laws. If you would like to work in a specialty area that is rewarding financially, you might want to consider the advantages of becoming a Certified Occupational Health Nurse. Involve yourself with post-graduate studies and continuing education to earn your certificate.